Reviewer’s Note: MMO games like DC Universe Online are filled with tons of content as well as receive new content on a regular basis making it very difficult to include everything the game has to offer in one review. 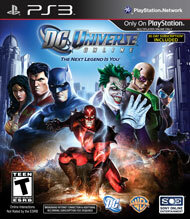 This review is based on some of my experiences playing on the Hero side of DC Universe Online. DC Universe Online is a massively multiplayer online action game. You will play in settings and environments from DC comics and team up to fight alongside or against iconic characters such as Superman, Batman, Lex Luthor, and Catwoman. Players have the choice to be a hero or a villain and fight against each other. Both sides, however, face an even greater threat in the form of Brainiac and must stop him to save the earth and its people. DC Universe Online features a plethora of content to explore. As you participate in missions, races, or just exploring the environment and finding collectibles, you will gain experience points. By gaining experience you will level your character up unlocking new powers and abilities. The game features a very robust character creator that allows you to customize your hero or villain with dozens of armors and clothing styles. The game is also more action-oriented than most other massively multiplayer games on the market. A player’s attention is required at all times in order to execute effective combos against enemies. DC Universe Online being a massively multiplayer online game means that you will be sharing the world with thousands of other gamers at the same time. Players can choose to play on a PVE or PVP server. PVE servers are mainly for gamers interested in playing alone, or with friends against computer-controlled enemies in various missions with no fear of being attacked by real-life players. However, both sides can agree to initiate in combat against each other by turning on PVP flags in their settings. PVP servers, on the other hand, allow real-life players playing villains or heroes to attack each other at any time. Parents will also want to keep in mind that DC Universe Online requires a monthly subscription fee (after the first 30 days) in addition to the initial cost of the game. DC Universe Online does feature plenty of violence, but such as is found in a recent Superman or Batman movie. There is no blood or gore from attacking enemies and they quickly disappear after beating them. One level, however, features blood dripping from the ceiling and pooling on the ground. DC Universe Online features some mild language. Words such as d**n, h*ll, and a** are used infrequently. The game also features a chat feature for real-life players to be able to communicate with each other. There is a chat filter that will block most bad language. Some players, however, have found other words to express themselves in less than desirable ways, but in my experience this does not happen very often. Players can choose to be a male or female character and dress them in superhero attire. If players choose not to wear any attire, they will run around in their undergarments. Many of the outfits for both men and women are skin tight. Many of the female costumes also reveal a lot of leg and/or cleavage. When creating your character you get to pick out your character’s super powers. There are many different types of powers to choose from such as fire, ice and gadgets. One power is the power of nature which involves using elemental powers. Another power is sorcery which according to the game’s description allows the player to “Revive your allies with a whispered incantation or summon occult pets to do your bidding.” In addition, some of the characters in the game have some type of magical powers such as the hero Zatanna and the villainous sorceress Circe. Players can also choose Circe as their mentor if they choose to play on the villain side. There are quite a few missions in the game that involve some type of Spiritual Content. Here are just a few examples: There is a mission that features the player fighting against super-natural beings that are described as judging the souls of men. These missions have you saving the doomed citizens who have been unfairly judged and damned. One mission has the player fighting a villain called the Avatar of Sin. The Villain Bane and his henchmen use an addictive steroid called Venom in order to power themselves up. The henchmen make comments suggesting it is highly addictive. Certain players can also choose a power called Venom injection which increases your power and defense for a short duration. Being a huge fan of Batman and Superman, and the fact that I really enjoy action-rpg games quite a bit, I found DC Universe Online to be a hugely entertaining and fun game. I have found myself making dozens of new friends that I play with on a regular basis. One thing the game does seem to promote above all is teamwork. It is a very rewarding experience to tackle some seriously challenging boss fights with a well-coordinated group of friends. If you are a fan of the DC Universeand you do not mind paying a monthly subscription fee then you may want to check this game out; provided that it meets your family’s entertainment guidelines. Just so you know. DC Universe Online is now Free to Play on Steam.